22 May 2010; Air India Express; 737-800; flight 812; Mangalore, India: The aircraft (VT-AXV) was on a scheduled international flight from Dubai, UAE, to Mangalore, India, arriving just after 6 a.m. local time. 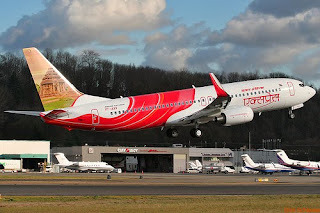 The aircraft landed on Mangalore airport's 2,450m-long runway, reportedly beyond the normal touchdown zone, and was unable to stop on that runway. After the plane departed the runway, it crashed through the airport's boundary wall and slid into a valley. The aircraft caught fire shortly afterwards. There were six crew members and 160 passengers and on board, including four infants. Early reports indicate that there were eight survivors. Both pilots were killed in the crash. At the time of the crash, visibility was 6km, with calm winds. The instrument landing system on that runway was also operating normally. This is the eighth serious crash involving a 737-800. The first was a September 2006 midair collision involving a Gol Linhas Aéreas 737-800 in Brazil that killed all six crew members and 148 passengers, and the most recent was a January 2010 fatal crash of a Ethiopian Airlines jet near Beirut. Four of the previous seven crashes involved passenger fatalities. 25 January 2009; Ethiopian Airlines 737-800 (ET-ANB); Flight 409; near Beirut, LebanonThe aircraft was on a scheduled international flight from Beirut, Lebanon to Addis Ababa, Ethiopia, and crashed into the Mediterranean Sea shortly after takeoff. There were 82 passengers and eight crew members on board, all of whom were killed in the crash. 29 September 2006; Gol Linhas Aéreas 737-800; Flight 1907; near Peixoto de Azevedo, Brazil: The aircraft was on a scheduled domestic flight from Manaus to Brasilia when it had a midair collision in the area of São Félix do Xingu with an Embraer ERJ135 Legacy 600 executive jet operated by ExcelAire. The ExcelAire Legacy 600 jet had been on a flight from São José dos Campos to Manaus. After the collision, which damaged the left wing, left stabilizer, and left elevator of the executive jet, the crew of the damaged ExcelAire aircraft was able to land at a nearby military airfield at Cachimbo, Brazil. The 737 subsequently experienced an inflight breakup and crashed about 30 kilometers (19 miles) north of the Peixoto de Azevedo municipality. The Legacy 600 was on the first leg of a delivery flight to the US The 737 aircraft was also relatively new, having come into service with the airline less than three weeks before the crash. All six crew members and 148 passengers on the 737 were killed. The two crew members and five passengers on the Legacy 600 were not injured. 5 May 2007; Kenya Airways 737-800; Flight 507; near Douala, Cameroon: The aircraft was on a scheduled international flight from Douala, Cameroon to Nairobi, Kenya. The aircraft crashed into a swampy area near the airport less than one minute after takeoff. The aircraft departed just after midnight local time and the aircraft sent at least one communication to the control tower prior to the crash. All nine crew members and 105 passengers were killed. 20 August 2007; China Airlines 737-800; Flight 120; Naha, Japan: Shortly after landing at Naha on the island of Okinawa, the left engine caught fire and the crew initiated an emergency evacuation. Although the aircraft was destroyed by fire, all 157 passengers (including two toddlers) and eight crew members survived. 10 November 2008; Ryanair 737-800; Flight 4102; Rome, Italy: The aircraft, on a scheduled international flight from Frankfurt, Germany to Rome, Italy encountered a flock of birds during approach to Rome, sustaining damage to both engines, the wings, and the nose. The crew was able to land on the runway, but aircraft had a collapsed landing gear and serious damage to the rear of the fuselage. All six crew members, and 166 passengers survived. 25 February 2009; Turkish Airlines 737-800; Flight 1951; Amsterdam, Netherlands: The aircraft, on a scheduled international flight from Istanbul, Turkey, to Amsterdam, Netherlands crashed in a field about a mile (1.6 km) short of the runway. Three crew members, including both pilots, were killed, as were at least six others among the 134 passengers and crew members. 22 December 2009; American Airlines 737-800 (N977AN); Flight 331; Kingston, Jamaica: The aircraft was on a scheduled international flight from Miami, FL to Kingston, Jamaica. The aircraft landed during a rainstorm, and was unable to stop on the runway. After departing the runway, the aircraft went beyond the airport fence, and crossed a road before coming to rest on a beach. The landing gear collapsed, both engines separated from the wings, and there were two major breaks in the fuselage, but all 148 passengers and six crew members survived. The landing was carried out with a slight tail wind. Air India Express is a subsidiary of Air India. The airline began operations in 2005, and has about 23 other aircraft in its fleet, all 737-800s. This is the first accident or serious incident involving this subsidiary of Air India, and the fourth fatal plane crash overall for Air India since 1970. AirSafeNews.com will provide updates on the investigation as information becomes available. Do plane crashes happen in threes? 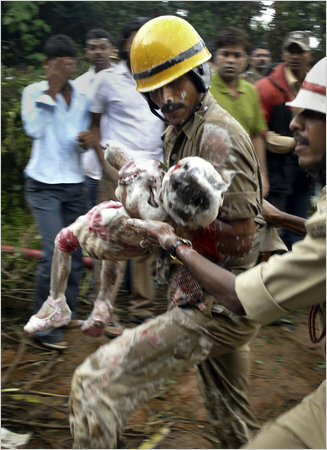 bodies have been captured from the debris of the Air India aircraft which collapsed & started burning today later overshooting the runway while landing at Mangalore Airport. How come you do not provide the weather,runway & weather, terrain and approach/navigation aid conditions as well as daylight etc.? Most of us pilots would like to know the environment the crew had to deal with and surely you can get that info without waiting for the pre-accident report.